PAWS pet of the week: Uma! 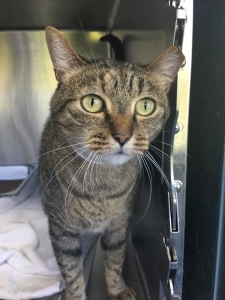 Uma is a gorgeous 3-year-old tabby cat who was a part of PAWS Chicago’s recent Hurricane Michael rescue effort. She is excited for a second chance at life in the Windy City! Uma is getting used to her new surroundings and making new friends (both people and other cats). She enjoys perching in the windowsill for a nice cat nap, and love to bat around her mice toys. She would make a wonderful companion and hopes to find her forever home soon! Meet Uma today at the PAWS Chicago Lincoln Park Adoption Center, located at 1997 N. Clybourn Avenue in Chicago. For more information, visit pawschicago.org or call 773-935-PAWS.